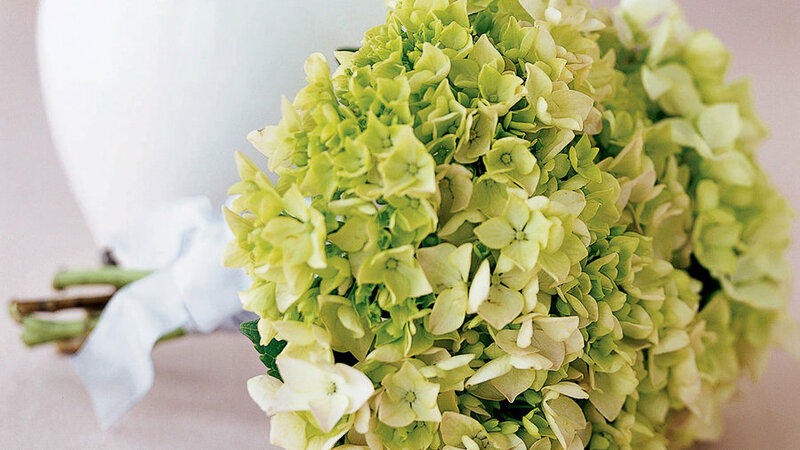 Fresh, ruffly garden hydrangeas are a romantic choice for wedding bouquets. In lightly shaded beds, garden hydrangeas (H. macrophylla) combine well with ferns of all kinds. Their large, snowball-shaped flower clusters come in pink, blue, and greenish white; just a few blooms make a bouquet. Plants grow to 4 feet or more. Florists’ plants, the larger-flowered kinds usually sold at florists or in markets in 6-inch pots, are shorter, usually reaching 1 to 3 feet tall. Hydrangeas grow best in areas where winters stay fairly mild, and they bloom over a long period in summer. Blue and pink flower colors are affected by soil pH― strongly acidic soil produces bluer colors; neutral to alkaline soil keeps them pink. More favorite flowering perennials. Planting time: March or April. Bloom time: June to August (longer in mildest climates). Start from: Container-grown plants (at least three 1-gal. plants per bouquet). Where to buy: Plants are widely available at garden centers and nurseries. Soil: Rich and porous; lighten heavy clay soils by mixing in compost or peat moss. Exposure: Full sun in coastal areas; partial shade where afternoons are hot. Planting: Dig a hole with sides that taper outward into the soil. Make the hole at least twice as wide as the rootball, and a bit shallower, then dig deeper around the edges of the hole’s bottom. Roughen the hole’s sides with a spading fork. Knock the hydrangea out of the pot, then loosen any coiled roots. Set the rootball in the planting hole; it should sit 1 to 2 inches above the surrounding soil. Backfill with soil you dug from the hole, adding the soil in stages and firming it around the roots with your hands as you work. Make a berm of soil around the plant to form a watering basin; irrigate gently. Water: Irrigate plants regularly during the growing season; established plants can get by on less water in coastal areas. Pruning: As flowers fade, new growth will start lower on the stems. To control the plant’s size and shape, prune in winter in mild climates. Cut stems back to the strongest pair of new shoots. For big flower clusters, reduce the number of stems. For uniformly rounded plants that will bloom over a shorter period, prune back all canes to growth buds within a few inches of the ground.